(Sugar Land, Texas, Sept. 24, 2018) - The Sugar Land Skeeters advanced to their third Atlantic League Championship Series in the franchise’s seven-year history Sunday night with a 10-6 victory in 10 innings over the Lancaster Barnstormers in Game 5 of the Freedom Division Championship Series at Constellation Field. Outfielder Tony Thomas sent the Skeeters to the victory with a walk-off grand slam. 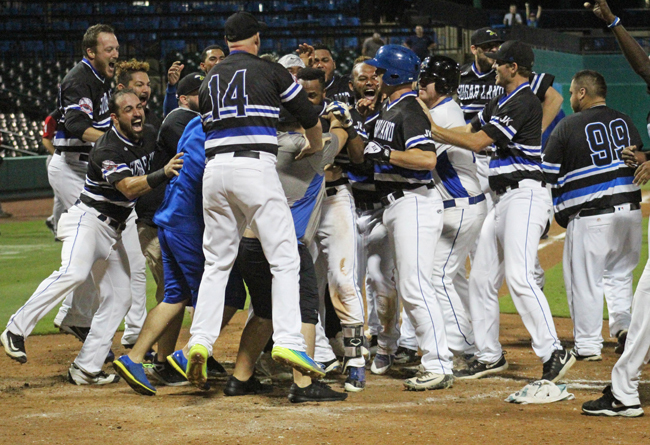 It marked the second extra-inning playoff win in Skeeters postseason history and it was the team’s first-ever walk-off home run in its postseason history. The Skeeters will begin the best-of-five Atlantic League Championship Series against the Long Island Ducks at 7:05 p.m. on Tuesday at Constellation Field. The Skeeters will also play Game 2 at 7:05 p.m. on Wednesday at Constellation Field before traveling to Long Island to play Game 3 at 5:35 p.m. CT, along with Games 4 and 5, if necessary. Trailing 4-0 through six innings, Sunday’s win was the Skeeters’ second-largest come-from-behind postseason win in franchise history. The Skeeters overcame a seven-run deficit to defeat the York Revolution in the Freedom Division Championship Series on September 21, 2016, at Constellation Field. The Skeeters entered the ninth inning of Sunday’s Game 5 trailing the Barnstormers, 5-2. Skeeters outfielder Anthony Giansanti led off the ninth inning with a solo home run and first baseman Matt Chavez added a solo homer two batters later. Catcher Derek Norris then delivered an RBI single to tie the game at 5-5. After the Barnstormers added a run in the top of the 10th, the Skeeters loaded the bases with one out in the bottom half of the inning to set up Thomas’ walk-off grand slam. The Skeeters are offering $5 field-box tickets to both Games 1 and 2 of the Atlantic League Championship Series on Tuesday and Wednesday, with both contests starting at 7:05 p.m. and gates opening at Constellation Field at 6 p.m. Fans can also enjoy $2 slices of pizza on Tuesday and $2 hot dogs on Wednesday. The $5 tickets are available now at SugarLandSkeeters.com, our mobile app, and at the TDECU Ticket Office at Constellation Field. For more information, call 281-240-4487. The Skeeters dropped Game 1 of the Freedom Division Championship Series at Lancaster by a score of 5-3 before winning Game 2 with a 3-0 victory. The Skeeters returned to Constellation Field for Game 3 on Friday and fell to the Barnstormers, 8-2, before picking up a 7-2 win in Game 4 on Saturday and the 10-6 win in Game 5. Giansanti paced the Skeeters offense throughout the Freedom Division Championship Series, going 10-for-21 (.476) with two doubles, a home run and three RBIs. Norris went 8-for-18 (.444) with a double and four RBIs throughout the series. The Skeeters will be making their first trip to the Atlantic League Championship series since the 2016 season, when they captured their first Atlantic League Championship with a 3-0 sweep over Long Island. They also appeared in the 2014 Atlantic League Championship Series, losing to Lancaster in three games. Former Major Leaguer and Skeeters left-hander James Russell, who won the Atlantic League’s ERA title with a 2.36 regular-season ERA, will take the mound in Game 1 of the 2018 Atlantic League Championship Series against Long Island left-hander Jake Fisher. Twelve players from the Skeeters’ 2018 roster had their contracts purchased by Major League Baseball organizations, which is a franchise single-season record. Two additional players had their contracts purchased by Mexican League organizations, giving the Skeeters a franchisebest 14 contracts purchased by other professional baseball organizations. Since the Skeeters joined the Atlantic League in 2012, the most contracts purchased by Major League Baseball organizations in a single season was 13 from the Somerset Patriots in 2017. Under the leadership of first-year manager Pete Incaviglia, the Skeeters finished the 2018 regular season with an 81-45 record, which were the second-most regular-season wins in franchise history. It was also the second-best winning percentage (.643) in franchise history and the Skeeters’ 52 home wins were the most in a single season in team history. Visit SugarLandSkeeters.com and follow us on Facebook, Instagram and Twitter (@SL_Skeeters) for all the latest news on the team. Download the official Sugar Land Skeeters app to keep up with the team all year long with news, score updates, stats and more. The free app is available in both the App Store and Google Play. About the Atlantic League of Professional Baseball (ALPB) The Atlantic League has been a leader in professional baseball and a gateway to Major League Baseball since 1998. Over 40 million fans have attended Atlantic League games and more than 900 players and 70 managers and coaches have joined MLB organizations directly from the ALPB. The Atlantic League emphasizes winning baseball games, showcasing the talent of top-caliber players and offering affordable family entertainment.